I am using both Linux Mint and Windows 7 on my laptop. 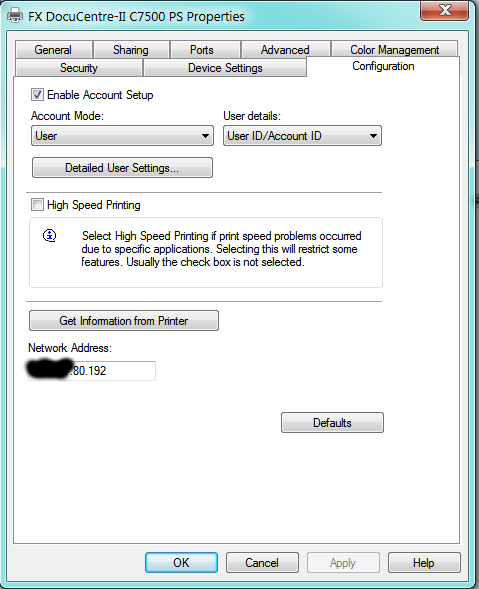 I can use the network printer in my office area flawlessly in Windows 7, which seems to use the LPR protocol and requires my ID and password. When I go to Linux, here comes the problem. 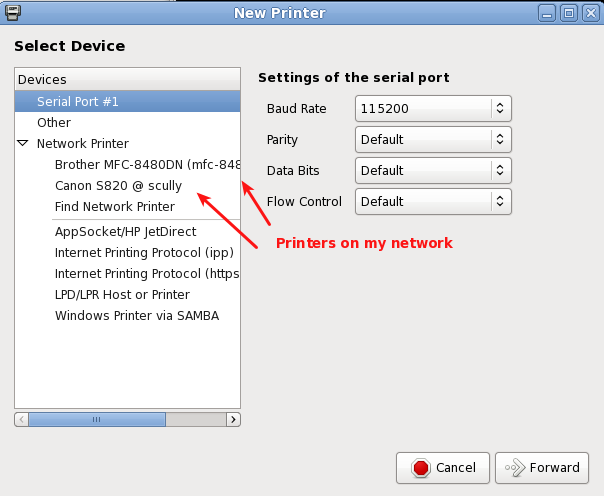 I set up the network printer with CUPS but cannot find anywhere to set my ID and password for the print service. It turns out that I can send the file for print to the printer successfully (indicated in the CUPS status) while the printer dose nothing but prompts an error. Click the Add button brings up this dialog. NOTE" You'll most likely be prompted for root's password at least once or twice. 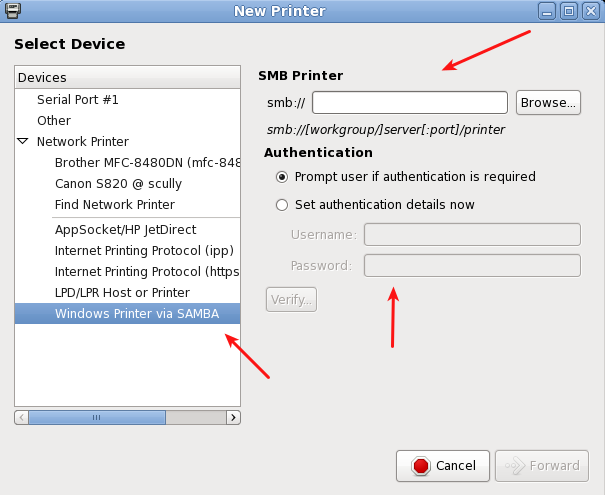 Select Windows Printer via SAMBA. After a discussion with @Lagrange it was determined that he had the following Fuji Xerox printer "FX DocuCentre-II C7500 PS". The following page was found over on the Ubuntu issue tracker. The #8 comment on this thread contained the solution. I'm excerpting it below so this question/answer can stand on their own. 4) tried to fix up some potential insecure uses of strcat() function. right-click on the printer, go to Properties, go to Job Options. At the bottom, enter "FXUserName" (case-sensitive) into the "add a new option" box, and click Add. Then set the value to the correct printer accounting code. edit /etc/cups/printers.conf, and inside the <Printer> or <DefaultPrinter> blocks, add a new line like 'Option FXUserName 123456'. Now restart the printing service with '/etc/init.d/cups start'. (such as Open Office) will not correctly apply the option if it's set using this method. @ryanau - I couldn't find any way to get the CUPS interface to allow a text entry dialog like that (except for adding your own option like in step a) above). I think the PPD interface only allows "PickOne"-style options. Not the answer you're looking for? Browse other questions tagged linux networking passwords printer or ask your own question. Is it possible to print without CUPS? 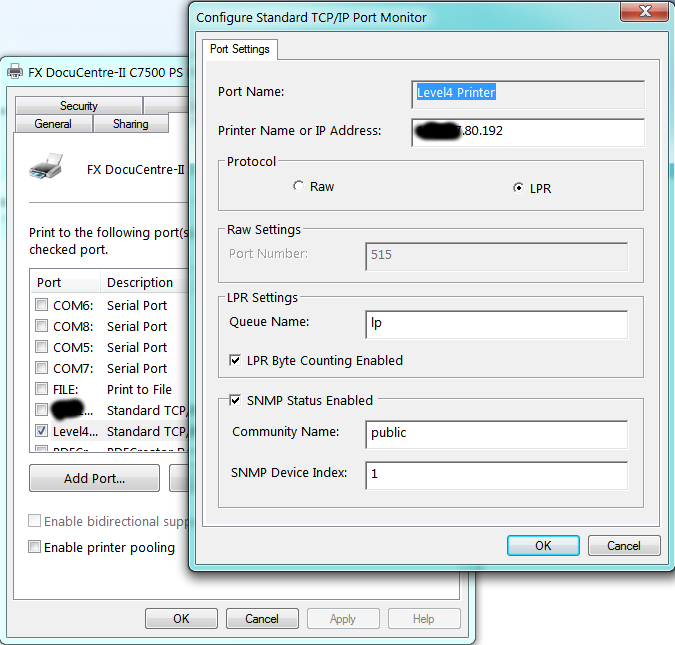 lpr does not see default printer - why?